Here are some tips to help you find your dream dress. Assemble a team to help you find your dress. You will be able to take up to 3 DRESSES at any one time to try on. Eat a good breakfast! You will need some muscle for hoisting the gowns…they weigh a lot more than you might expect. Have a personal assistant to help you in and out of the dresses. While we have volunteers to help…this will assure you have the help when you need it. Bring along someone you trust who will give you an honest opinion when you look great in a gown. ARRIVE EARLY! Perhaps very early. Once you check in…you can visit our mini Bridal Show vendors. You will be given a “ticket” to enter based on your “check in” time, and not loose your place in line. Keep your goal in mind. 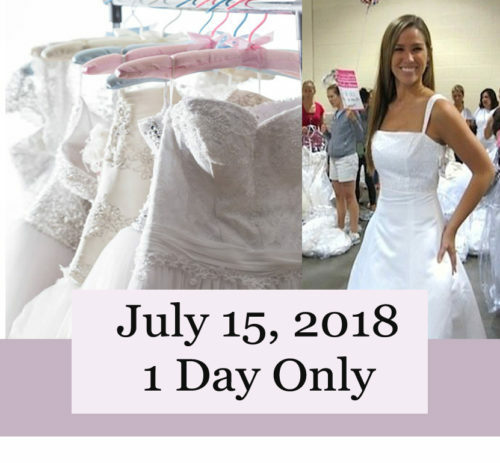 If your main goal is to get a discounted wedding dress, be flexible. Talk to our Bridal Shop Volunteers who can give suggestions on how to alter and modify your dress to make it truly special. Alterations staff will be available for consultation. Dressing Room and Mirrors are available. ⟵Selecting the right dress for you!